Kickstarted to success in 2015, Hollow Tree Games has confirmed its first-person exploration sim The Shape Of The World is heading to Nintendo Switch, PC and other consoles, "in the next few months." It's a sedate, relaxing experience where you procedurally-generated world you explore changes and expands as you move through it - everything from the wildlife to the soundtrack itself changes depending on where you wander. 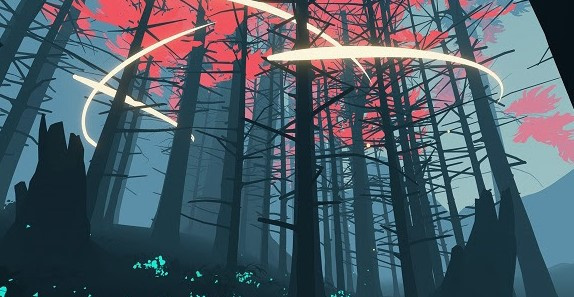 It's going for a vibe somewhere between the recently released Fe and the free-form exploration of Proteus, and it's just the kind of out-there experience that would suit Nintendo's own evolving handheld console. 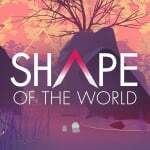 "I’m thrilled to officially announced that Shape of the World is coming to Nintendo Switch this year," said Hollow Tree Game’s founder Stu Maxwell, who also works as a senior VFX artist for The Coalition, the studio behind Gears Of War 4. "Nobody on the team expected the game to look so nice on the Switch, we’re really happy with it… We can’t wait to see what everyone else thinks." I've been growing interest in walking sims lately, looks like a great place to start. Looks like No Man's Sky on land. Many indie game looks somewhat interesting but cr*p when playing and then it just fades into obscurity. So much money and energy are wasted on these type of projects. So is that all you do? That doesn't sound very interesting. At least the game itself looks beautiful. Eh, I'll try it f the price isn't that high. You could say, it'll grow on you. -Laid-back, relaxing exploration: No ticking clock or perils laying in wait will prevent you from enjoying your journey here. -An organic and mysterious ecosystem to play with: Interacting with graceful animals, ephemeral flora, and intriguing monoliths alter the world in vibrant and unexpected ways. -Procedural population: The forest only materializes around you when you get close, regrowing in a new way each time you pass. What will you find when you retrace your steps? -A dynamic soundtrack that responds to the player’s travels: The audio shifts along with the visuals, providing an enveloping aural and immersive experience. If the developers and artists enjoy their work and are happy with the project when it's finished then I don't think it's a waste of either time or money. Unless you meant purely from a business perspective. Personally I think this game looks very surreal and beautiful and I look forward to buying it and playing through it for a while. Remind me No mans sky. Looks nice. Intriguing, but I will wait for some reviews. Looks quite nice! Looks nice, but I'll need to wait for a review. Walking Simulators are dangerously good at looking substantial and then having little to chew on while you're walking about. @0muros No man's sky would be such a good fit on the Switch. @Aven Oh yes!! Its what I think too. No mans sky is not a Perfect game but its pretty awesome! Got it for 20$ on ebay and I have a lot of fun on PS4. I want to believe it will come to Switch. Did you try it? @0muros yes I have it on PS4 too but I never get the chance to set it up as the kids and wife always have the TV. The switch had been a godsend for me. Same again. The portability of the Switch is perfect. Playing at job its so great. The fact that the console is not static make me connect more with it. Peoples who say that they dont like portability, I just dont understand. I imagine you feel the same about Dark souls remaster in portable mode coming to switch? So get high without getting high? Well, thats one way to sell subpar draw distance! Would love to play Firewatch on the Switch instead but if this is good, I'll bite. I think this is comparable to a couple of download games found on Playstation, games that are only for meditation and don't have real gameplay.